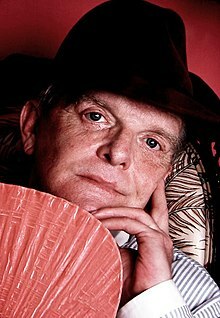 Truman Garcia Capote (/ˈtruːmən kəˈpoʊtiː/; born Truman Streckfus Persons, 30 September 1924 – 25 August 1984) wis an American novelist, screenwriter, playwricht, an actor, mony o whase short stories, novelles, plays, an nonfeection are recognised leeterar classics, includin the novella Breakfast at Tiffany's (1958) an the true crime novelle In Cold Blood (1966), which he labeled a "nonfeection novelle". At least 20 films an televeesion dramas hae been produced o Capote novels, stories, an plays. ↑ Clarke, Gerald (1988). Capote: A Biography. pp. 4–7. This page wis last eeditit on 30 September 2018, at 06:21.